Rechargeable lithium-ion battery electrodes are prone to corrosion for the potential of the electrodes often falls far beyond the stability limit of the electrolyte in order to maximize the energy density. Correspondingly, the concept of solid-electrolyte interphase (SEI), originated from the reduction of the liquid electrolyte on electrode surface, lays the cornerstone of today’s batteries. The conventional wisdom believes that electrodes can be passivated quickly by the SEI layer during the battery formation cycle, and after which corrosion can be eliminated by the blockage of charge transfer. Effective anti-corrosion is an especially critical research topic for lithium (Li) metal anode, a material dubbed as the “Holy Grail” of battery chemistry thanks to its over ten-fold higher theoretical capacity compare to the state-of-the-art graphite anode. We have always been wondering “is a passivating SEI on Li metal surface alone sufficient to achieve electrochemical stability”? The answer is not, according to our recently study, where we revealed an additional corrosion pathway for metallic Li in conjunction with copper (Cu) substrate, the commonly-used anode current collector. 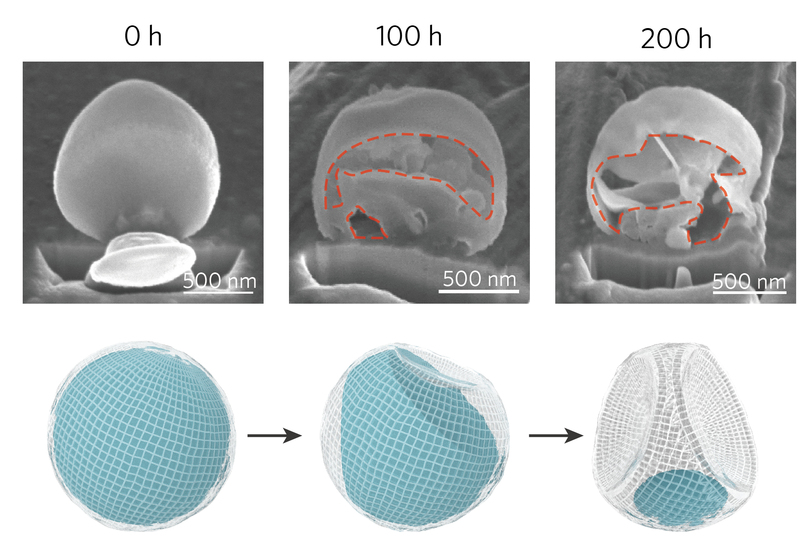 The study stemmed from an interesting observation that deposited Li particles tend to show surface concavities when rested in the electrolyte. We carried out detailed studies on the morphological evolution of the Li deposits in electrolyte and found that the corrosion of Li on Cu can be described by the typical Kirkendall effect, a phenomenon attributing void formation to the disparities between inward and outward mass transport, which can ultimately lead to the complete consumption of Li metal. The expected termination of Li corrosion was not observed even after prolonged rest of hundreds of hours, indicating the existence alternative corrosion pathways in addition to the direct charge transfer on Li metal surface to form SEI. To account for the fast, continuous corrosion of Li on Cu surface observed in this study, we suggested an additional corrosion mechanism that has been almost overlooked in previous studies, which is the galvanic corrosion of Li in conjunction with more noble Cu substrate through an internally formed galvanic cell. Due to the relatively weak passivation power of the SEI on Cu, electrons were transferred from Li to electrolyte through Cu, with Li+ diffusing outward through the SEI on Li surface. Moreover, when the galvanic corrosion current was quantitatively measured, it was found to contribute to as high as approximately 80% of the total corrosion in our system. The drastically different corrosion kinetics between Li and Cu can be attributed to the disparities in the physiochemical properties of the SEI on the two surfaces. The SEI on Cu is not only 2-3 times thinner than that on Li, but also much richer in organic species, as revealed by both cryogenic electron microscopy (cryo-EM) and X-ray photoelectron spectroscopy. Although the two surfaces share the same thermodynamic driving force (equipotential), it is known that the decomposition of electrolyte is a complex, multi-electron and multi-step process, and some reduction reactions, especially the rate-determining steps can be more favorable with a synergy between charge-transfer and nucleo/electrophilic attack. Li surface exhibits higher electron density to facilitate the reactions. And such direct charge-transfer would result in a higher Li-ion concentration near Li metal surface, which is also beneficial for the precipitation of inorganics. With the above discussion, we can now propose a comprehensive picture describing the galvanic corrosion process of Li. Due to the fast formation of a thick, inorganic-rich passivation layer on Li metal surface, corrosion through direct charge-transfer can be effectively arrested after a short period of stabilization inside the electrolyte. However, the electrolyte decomposition on Cu is rather slow, which is unable to afford a compact passivation and might allow continuous mass/charge transport through the interphase. Furthermore, given the sluggish reduction kinetics, the reduction products are more likely to stay at higher oxidation states (organic species), and thus are prone to dissolving into the electrolyte. In the end, an equilibrium between reduction and dissolution can be reached on Cu surface, bringing about a steady galvanic corrosion. 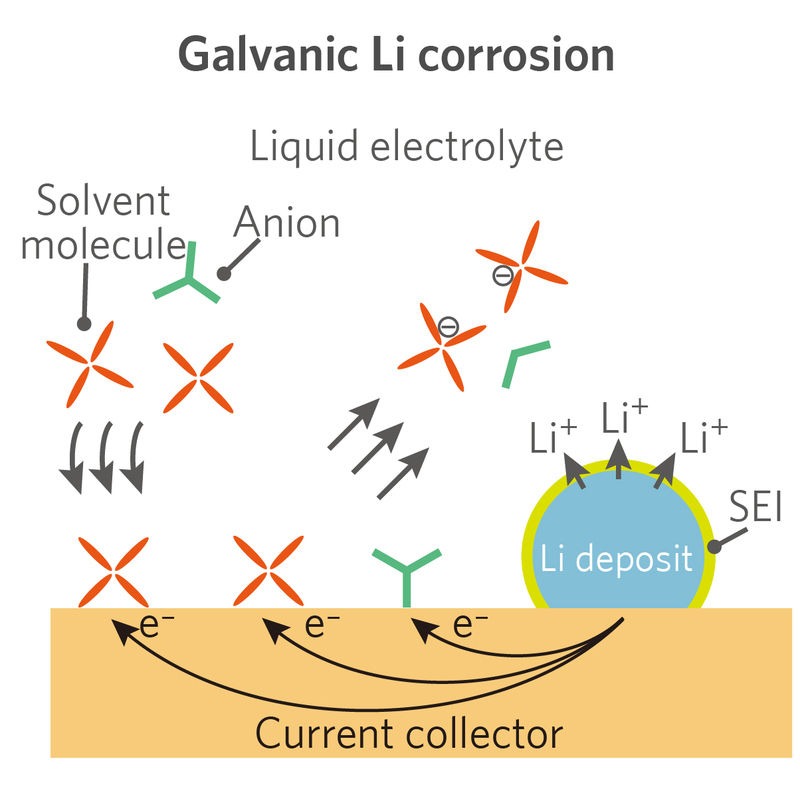 Galvanic corrosion poses additional challenges on Li anode, and careful evaluation of the chronic electrode stability is needed in future studies. The possibility for the conductive substrate to be exposed to electrolyte during battery operation shall be minimized, and the effect should also be considered when designing new electrode architectures that involve larger conductive surfaces. Several strategies might be employed to mitigate galvanic corrosion. First, current collector passivation with good electrical insulation and low electrolyte permeability can be developed, which has emerged as an intensively studied topic for homogenizing Li deposition. In this study, we have also demonstrated significantly reduced galvanic corrosion by passivating the Cu surface with a layer of electrically-insulating LiF coating. Second, planar and dense Li deposition, if can be fulfilled, will physically isolate the substrate from the electrolyte and block the galvanic corrosion pathway. Third, the development of all-solid-state batteries can help circumvent the issue by stabilizing the interface and avoiding excessive side reactions.